To some extent, we are prisoners of our time and the culture. So in that understanding, I admit to being a Francophile when it comes to wine labels. I like most French wine labels because they’re traditional. The year is identified along with the very specific area where the grapes are grown. If you know the region, you know the grape(s). Whether or not the wine is estate bottled is on the label. Information about fermentation is widely available to anyone whether inside or outside the trade. Along comes Pernod Richard USA with Dead Bolt wine, developed by Premium Wine Brands global wine division. 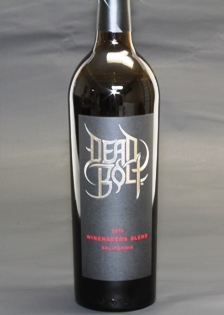 Dead Bolt is the first Californian still wine in the portfolio of Pernod Ricard USA and its label is anything but traditional. Silver lettering in the form of tattoo iconography spells out the name against a black label. Below that, in red type, appear the year, “Winemaker’s Blend” and the word “California.” California is a large area compared to Bordeaux France for example. (Bordeaux is 1,496.2 square miles. California is 158,648 square miles). And while Bordeaux wines are clear in labeling wines by region and sub-region and even defining areas more specifically, and although California has several designated AVAs, all we are told is that Dead Bolt is California wine. The company’s own material states “The Brand’s packaging and branding was designed to attract the adventurous consumer.” There are references to the package as the centerpiece of marketing in the “irreverent wine category” and the wine being for “people who make their own rules.” The back label states, “You like to do things your own way and so do we.” Really, what does all that mean? It sounds more like a cigarette advertisement or a perfume commercial. I don’t like any of it. But I had been twice assigned to pouring this wine at different events and, of course, needed to taste it. I learned it is a blend of five grapes: Cabernet Sauvignon, Merlot, Zinfandel, Petite Syrah and Syrah and “other carefully selected components.” While I understand the exact proportion of each grape’s contribution to the blend is proprietary and a closely guarded secret, I would like to know what these “other carefully selected components” are. Wine is produced, after all, for people to consume. All this aside, I have to say the wine tastes above its suggested retail price of $15. In fact, it’s commonly available for $9 - $10. As such, it competes against brands like Constellation’s “The Dreaming Tree” label (also a red blend) and Chateau Ste Michelle’s Indian Wells and Coppola’s “Diamond Collection” (priced slightly higher). That’s too bad, because Dead Bolt does offer complexity through its careful blending/mix of varietals. Admittedly, it is a not as subtle as a Chateau Petrus. But at a price of about two-thousand, seven-hundred and eighty-five dollars less per bottle, it serves as a better teacher of what complexity in wine is all about, and (at commonly found prices of about $10 for Dead Bolt) you can better afford the education. Be advised, this is not a wine (no matter your level of OCD) that you can enjoy over two or three days. No matter how zealously you vacuum pump the bottle, my experience is that the wine will go flaccid, lose its zip and become too juicy. So enjoy it with friends. Dead Bolt is a natural for barbeque. It’s easy drinking; happy with hamburgers and spicy food or on the patio with brats and spicy mustard. After all, according to Pernod Richard USA, this wine is “for people who make their own rules”. If you can get past the hype and the packaging, you might enjoy the wine. I did, and I’m a stodgy traditionalist.